It's hard to look back upon the original Kane & Lynch and its baggage and remember it too fondly. But IO Interactive and crew are at least turning out intriguing trailers for the sequel, Kane & Lynch 2: Dog Days. 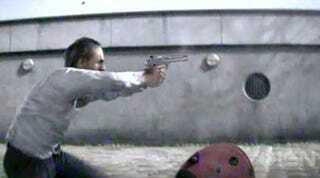 The action portions are shot with much of the grainy, shaky cam styling seen in previous Kane & Lynch 2 trailers, a treatment we expect to see throughout the PlayStation 3, Xbox 360 and PC sequel. The rest—like watching Lynch relieve his bladder and think deep thoughts—is more standard, story-building stuff. But if IO can pull off gun battles that look this interesting, on top of the online co-op and quirky gameplay twists, we may like Dog Days for more than its visual style. This time you&apos;re Lynch, and you&apos;ve got online co-op. The trailer from IGN is after this and falls under the potentially not safe for work banner, due to its violence and salty language. Kane & Lynch 2: Dog Days is officially due this fall.